It is time for Fish Fries in Omaha again! 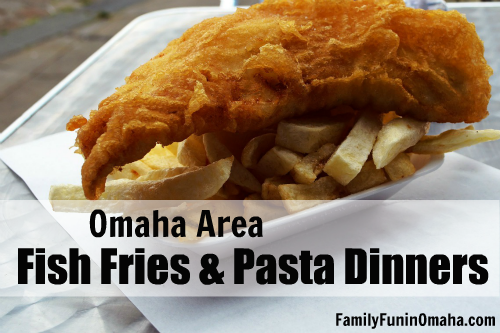 Find your favorite or discover the best Omaha Fish Fries or Pasta Dinners! It is a favorite tradition for many local families, with some groups “Fish Fry Hopping” to a different location each week. Many offer kids activities, a drive through/takeout option, and help support local churches and schools. Bit of advice: Arrive early as lines can get very long. Enjoy good food, great fellowship, and support your local community at the same time! 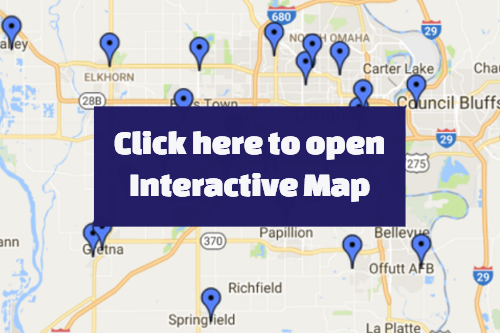 To add or update your church’s Omaha Area Fish Fry or Pasta Dinner, please contact us here! Please Note: Although we attempt to keep our information as accurate as possible, it is always a good idea to verify with the particular location before visiting. * = Pre-Lenten Fish Fry on Friday, March 1, 2019. Adults $10, Children (ages 10 & under) $5. Adults $10, Veterans $9; Children (ages 2-12) $5. *Pre-Lenten Fish Fry on Friday, March 1, 2019 (4 – 8 p.m.). Fridays, March 1 – April 12, 2019 (4 – 8 p.m.). *Pre-Lenten Fish Fry on Friday, March 1, 2019 (4:30-8:30 p.m.). Fridays, March 1 – April 12, 2019 (4:30-8:30 p.m.). Adults $12; Seniors $10; Children (under 12) $7. Fried or baked fish, mac & cheese, spudsters, fries, coleslaw, bread, coffee and tea. Other beverages and desserts available for purchase. Drive-thru service available (5 – 8 p.m.). Adults $11, Seniors $8, Children (ages 5 – 12) $7. Fried Pollock, grilled Salmon, stuffed Salmon (stuffed with crab cake), fried shrimp, steak and mac & cheese. All dinners come with fries, coleslaw, rye bread & butter. (Prices vary by item). Adults $10, Seniors $8, Children $6, Children (age 2 and under) FREE. Baked Tilapia, fried Cod, coleslaw, veggie medley, Tater Tots, cheese pizza, mac & cheese, rolls/butter, beverages, desserts. Beer, Margaritas and wine available. Adults $12, Children (ages 4 – 12) $6, Children (age 3 and under) FREE. Visa and Mastercard credit cards accepted. No carry out; dine-in only. Every Friday during Lent, except Good Friday. Fried and baked fish, along with all the trimmings. Adults (ages 15 – 59) $10, Seniors (60+) $9, Children (ages 5-14) $8, Children (4 and under) $3, Family $30. Beer-battered fried fish, baked fish, fried shrimp, baked potato, fries, hushpuppies, coleslaw, salad, soup, bread, desserts, pop, wine and beer. Mac & cheese, cheese pizza, and fish for the kids. Take-out available. Plus, cookie decorating and face painting for the kids. Adults $11, Children (12 and under) $5, Seniors (60+) $10. Adults $9, Children (under 10) $6, Seniors (60+) $8, Other options available. *Pre-Lenten Fish Fry on Friday, March 1, 2019 (4:30 – 8 p.m.). Baked & fried Pollock, mac & cheese, grilled cheese, pancakes, french fries, tomato soup, coleslaw, lettuce salad, and a Bake Sale. Beer, wine and pop available. All you can eat. LIVE music with Win Lander. Adults $11, Seniors: $9, Children (12 and under) $7. Fish Fry for March 22nd has been cancelled. They will be ready again on March 31st! Choose from 4 sauces: Marinara, cheese, clam, and meat. Also includes garlic bread, salad, and a drink. Each adult meal ticket receives two tickets for wine (age 21+ with valid ID). Desserts with donation. Adults $10, Children (ages 11 and under) $5. Entrées include baked Cod, fried Cod, fried shrimp, Salmon (weekly special*), cheese pizza, mac & cheese, tortellini w/marinara sauce. Dinners include baked potato or french fries, bread and coleslaw, lemonade, water and coffee. Beer, wine, Sangria, soda, clam chowder, and desserts available. Carry-outs available. Adults $10, Children (12 and under) $5, Salmon/Weekly Special $12. Large family discounts. Menu items include fried fish, fried shrimp appetizers, baked fish, french fries, mac & cheese, Sam & Louis cheese pizza, green beans, coleslaw, bread, desserts. Drive-thru available. Entertainment includes a magician, clowns making balloon animals, face painting, and temporary tattoos for the kids. Plus, there will be a “Meat Wheel” raffle, and a different Craft Brewer each week. Adults $11, Children (ages 12-4) $5, Children (ages 3 and under) FREE. Sodas and water $1 each. Their Fish Fry is unique in that most of the food they serve is Gluten Free. Fried fish, baked fish, shrimp, scalloped potatoes, hand-cut french fries, green beans, coleslaw, all Gluten Free. Adults $12, Children (ages 10 & under) $6. Menu: Bread Stick, Lettuce Salad, and Green Beans Almandine, And choice of (2): Pizza Cheese, Veggie, or Garlic Shrimp, Baked Mostaccioli with Marinara Sauce, Baked Macaroni & Cheese. Water and Lemonade. All proceeds will benefit the St. Robert Bellarmine Youth Ministry Program. St. Stanislaus Men’s Club presents “Save a Fish, Eat Pasta!” Lenten Dinners. This is the only Lenten dinner in town featuring pasta, pizza and Pierogi! All-you-can-eat pasta (comes with bread, salad, and choice of water, pop or beer) $7; Children under 12 pasta dinner $5; Family for pasta $25; Orsi’s pizza $2/slice; Hand-made Pierogi $2/each; Desserts $0.50. Fried or Baked Fish, Cheese Pizza, Macaroni & Cheese, Slaw, Fries or Baked Potato. Desserts, pop and beer available. Carry-out available, credit cards accepted. Adults $9; Seniors $8; Children 4 – 12, $6.